Each consultancy is for up to six months and is to be completed no later than August 31, 2015. Up to three consultants will be selected. Appointments of shorter duration can be considered, depending on the goals in the consultant’s proposed scope of work. A major purpose of the consultancy is to provide recent PhDs who have strong disciplinary training with the opportunity to demonstrate competency in rural development research and Extension curriculum design that relate to the NCRCRD’s twelve-state region. At the end of their post-doctoral experiences, the consultants will enjoy a network of senior academic and policy colleagues from which they may launch successful careers as junior faculty members or policy analysts. The consulting rate is expected to be commensurate with recent PhDs in the individual’s field of study. The consultants selected under this competition may relocate to the greater East Lansing area, and can be provided with an office on the Michigan State University campus, or they may elect to interact with the NCRCRD through short-term visits from a remote location. The consultancy may involve additional travel related to the scope of work. Pre-approved travel will be reimbursed by NCRCRD. • PhD in a social science, completed by the date of the first day of the consultancy. • Strong English written and verbal communications skills. • Ability to travel independently by air and drive an automobile. • Academic record of publications related to the issues to be address by NCRCRD. • Demonstrated ability to synthesize academic inputs from a wide array of sources. • Understanding of the land grant university system. • Demonstrated interest in topics addressed by NCRCRD. Individuals competing for the position should expect to begin sometime in March, 2015. Individuals who hold ABD status are strongly encouraged to apply but should expect to finish their PhD before starting the consultancy. Interested persons should submit a letter of application and proposed scope of work culminating with a webinar or series of webinars to disseminate the results of the work to participants in the NCRCRD’s twelve-state region. 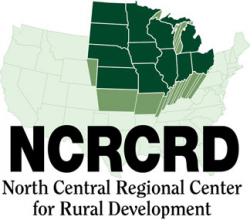 The scope of work should address issues pertinent to persons implementing rural development work in the NCRCRD’s twelve-state service area, and any proposed study should include some or all of the region as its focus, although comparisons with other regions are acceptable. Individuals holding ABD status should specify their expected date of degree completion. In addition, curriculum vitae, electronic copy of PhD program course transcripts, and cell phone contacts for three professional references should be provided. Review of applications will begin February 3, 2015 and conclude when the consultants are identified. Email application materials to loverid2@msu.edu using the subject line “NCRCRD post-doctoral consultant”.